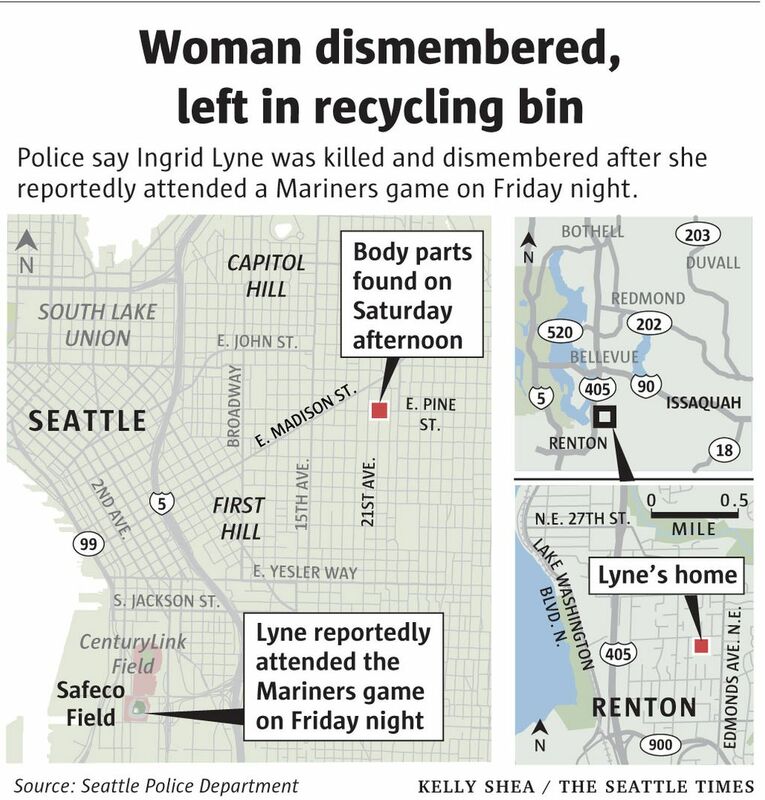 Body parts found Saturday in a recycling bin in Seattle’s Central District have been tentatively identified as those of a Renton woman reported missing after she went on a date in which she planned to attend Friday night’s Mariners game. 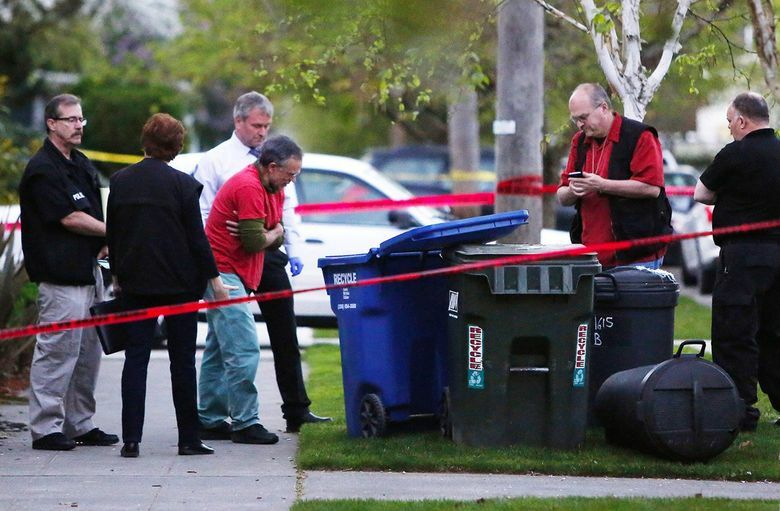 Seattle police arrested a 37-year-old man Monday after three body parts found Saturday in a homeowner’s recycling bin in the Central District were tentatively identified as those of a Renton mother of three reported missing after going on a date. Police said at a news conference late Monday afternoon that they had taken John Robert Charlton into custody in the slaying of Ingrid Lyne, 40, a nurse at Swedish Medical Center. Charlton, who was publicly identified by Police Chief Kathleen O’Toole, was booked into the King County Jail for investigation of homicide. Charlton was taken into custody early Monday morning in Snohomish County, police said. His criminal history includes convictions for misdemeanor assault in King County in 1997, felony theft in Montana in 2009, second-degree aggravated robbery in Utah in 2006 and misdemeanor battery in a 2009 case in Idaho, according to court records. He also was found guilty of possession of marijuana in 1997, with the charge deferred if he completed alcohol school and other conditions. Lyne’s friends took to social media over the weekend with concerns about her welfare. They reported that the single mother went on a date in which she planned to attend Friday’s Seattle Mariners game with someone she had met online. Some of the social-media posts identified Charlton as Lyne’s date. His name and photograph were posted on Facebook, before the announcement of his arrest, by people who identified him as Lyne’s date. Lyne wasn’t home Saturday morning when her former husband planned to drop their children with her, police said. 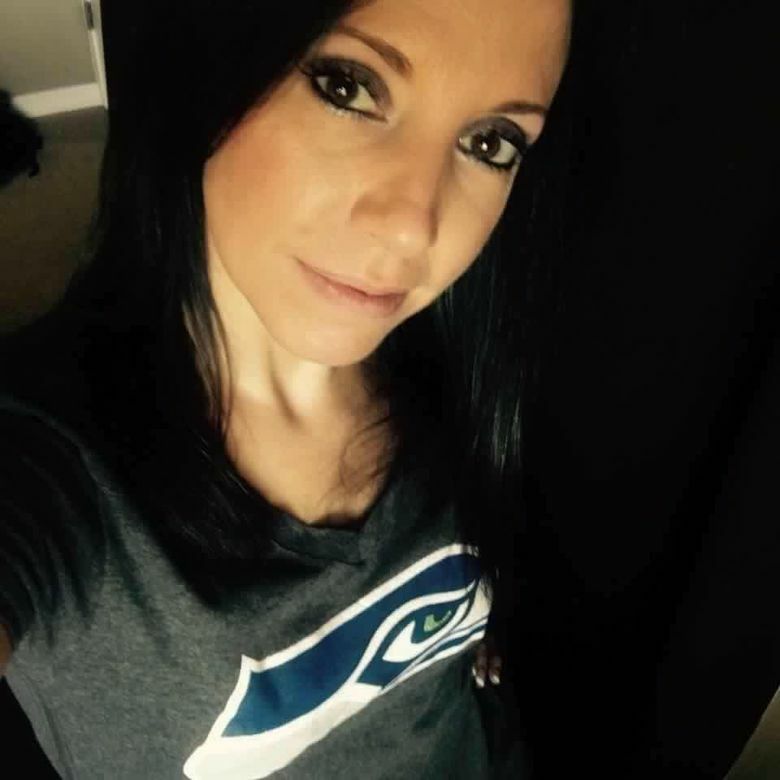 She was reported missing just after 10 a.m.
Lyne’s neighbors along Camas Avenue Northeast, a middle-class cul-de-sac where she lived with her three daughters in Renton’s Upper Highlands, braced for the worst Monday before word of her fate was announced. Before leaving, detectives spoke with a resident at the end of the cul-de-sac whose home is monitored with a security camera, Frances­china said. “We all see each other and know each other and keep an eye out for each other,” he said of the neighborhood. All three of her daughters, ranging in age from about 8 to 12, were born after Lyne moved into the house. Lyne split with the girls’ father a couple of years ago, when he moved out of the home, Franceschina said. Reached by telephone Monday, her ex-husband, Phillip Lyne, said he couldn’t discuss the matter. The King County Medical Examiner’s Office will officially determine an identity. A suspect — Charlton — was identified, police said. After being taken into custody, he was interviewed by Seattle homicide detectives before being booked into jail, according to police.